A party always starts with the invite. This sets the theme for everything! The cards was inspired from Pinterest like many other things you will see this week. Looking at the pinspiration and the invite that I made I wish I would have popped the faces out with a pop dot. But craft and learn. The pinspiration card was made with all punch cuts. Since I have a Cricut Expression I wanted to use that instead of buying something new. After laboring away to create that scallop shape I found one already made on a cartridge. I was a little frustrated by then. The scallop can be found on the Cricut Cartridge Birthday Bash under the letters, shift. It is intended to be a tag, but if you have the Cricut DesignStudio Software then you can hid the tage holes and it will be a solid scallop. For all the other faces I used the Cricut Cartridge Sesame Street Friends . It was a PAIN to get the faces the right size but I was so happy with it. Each face also had a million pieces. Hindsight I dont really like the way Bert and Ernie came out but I love Oscar and The Count. To make the can lines for Oscar's square I used a paper trimmer with a scorer 'blade' . 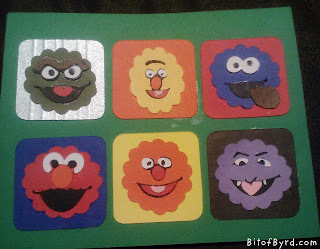 I am going to be doing this theme again in the summer for my niece and I think I will make the card with only 4 characters and take out Bert and Ernie.